The Smoking Gun website has come up with a sensational but bogus claim that I collaborated with a hacker, Guccifer 2.0, to hack data from the DNC and have Wikileaks release it. This is another absurd media claim that is part of the long-standing absurd media claim the Donald Trump had anything to do with the Russians. This is a charge without a shred of evidence. The Smoking Gun is neither hot, nor smoking on this one. Their sequence of events is wrong. Now I see Raw Story, GQ and a parcel of lefty me-too recycle shops are posting this steaming pile of dung. Sorry boys, but the FBI does not have proof I colluded with the Russians. They have nothing. 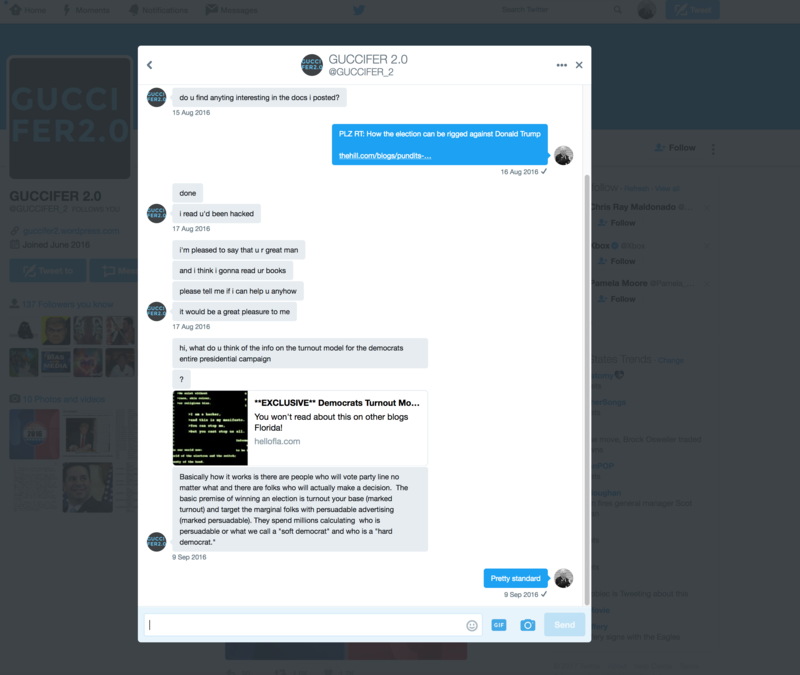 All contact I had with the entity known as Guccifer 2 came after I had written an article that was published on August 5th 2016 by Breitbart News and vetted by their lead investigative reporter Lee Stranahan. That article came after the DNC and DCCC material had been released and identified the role of a hacker going by the moniker Guccifer 2 based on our own sources. Note: At least some of the information published by Wikileaks came in a documents hand-off to Craig Murray, a respected U.K. diplomat who has confirmed this. Most in the MSM have not reported this. I reported that a hacker calling himself Guccifer 2.0 had published the rest prior to Wikileaks publishing. On August 14 – some ten days later – I noted on my Twitter feed that Guccifer 2.0 who had been suspended by Twitter had been reinstated. I did so because I abhor censorship. 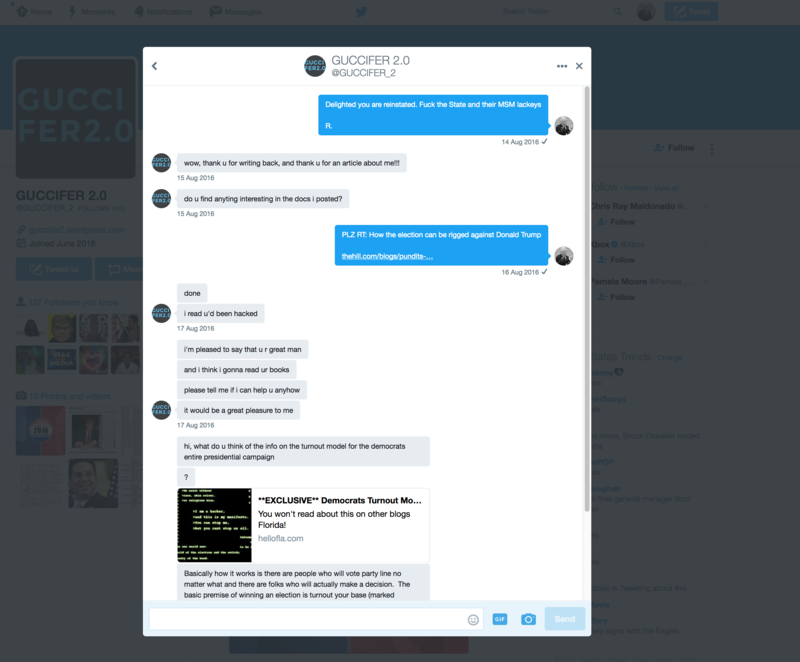 Then I did in fact have a short and innocuous Direct Message exchange with Guccifer 2.0. It was so perfunctory, brief and banal I had forgotten it. Not exactly 007 stuff even if Guccifer 2.0 was working for the Russkies. To reiterate, I myself had no contacts or communications with the Russian state, Russian intelligence, or anyone fronting for them, or acting as intermediaries for them. None. Nada. Zilch. I am not in touch with any Russians, don’t have a Russian girlfriend, don’t like Russian dressing and have stopped drinking Russian Vodka. The vaunted New York Times reported on January 19 that intelligence sources said they had e-mails and records of financial records that proved the Trump Campaign-Russian collusion. Later in January, the New York Times said intelligence sources also said they had transcripts of intercepted phone calls. So where are they? House Intelligence Chairman Devin Nunez says his committee has seen no proof. I challenge them to produce said “proof.” This exchange with Guccifer 2.0 reported by The Smoking Gun proves nothing.